Cordless, pen-style high output LED. Powerful 10 second cure with audible beep. The slim curing probe is ideal for posterior access and for enhanced visibility. The base is stable and it’s easy to seat the handpiece, but very little counter space is required. The Coltolux LED has a 2-year warranty from purchase date. The lithium ion battery is included in the 2-year warranty and has a life expectancy in excess of 5 years, according to Coltène. The non-replaceable battery design allows a much smaller and sleeker design than competing units. Filtek is a trademark of 3M ESPE; Esthet-X is a trademark of Dentsply International; Herculite is a trademark of Sybron Dental Specialties; Heliomolar is a trademark of Ivoclar Vivadent. You are welcome to use the Coltolux LED curing light on a complete satisfaction guarantee basis; if you are not fully satisfied with this product, return it within 30 days for a complete refund. You may use one in your office on a trial basis; however, we can only accept the return of one unit in used condition. Contains: 1,000 disposable barrier sleeves. Coltolux LED was used over 500 times by 12 consultants. This product received a 95% clinical rating. The Coltolux LED curing light is designed for intra- and extra-oral polymerization of light-cured composites with camphorquinone (CQ) photo-initiators. Light output range is 450-470 nm. 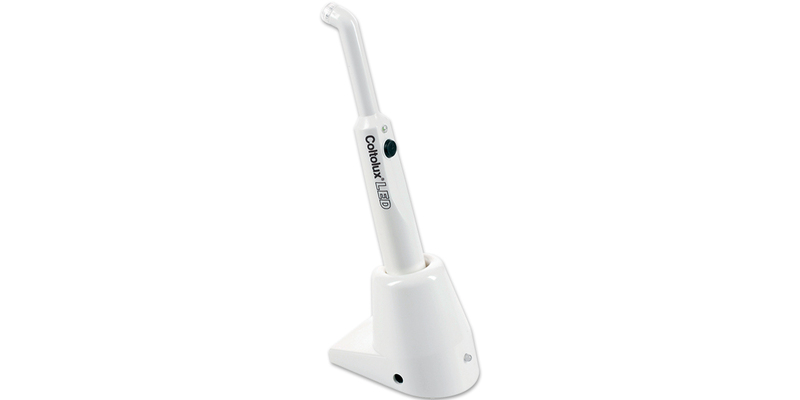 The unit consists of a cordless LED handpiece that seats in a charger base when not in use. The wand-style light contains the LED at the tip, covered by a replaceable light lens. During charging, the light on the charger base is red. When fully charged, the lights on the base and on the handpiece are green. Initial charging requires about three hours. Coltolux LED is very simple to use with its compact slim size and lightweight. The small size of the base is also a positive feature since it requires very little counter space. The base was stable, making it easy to seat the handpiece for charging or when not in use. The light is easy to activate and very quiet during operation. A single button controls the unit, which beeps at 10-second intervals. The unit produces high-intensity light, and the quality of cure was judged to be excellent. Two areas that concerned some consultants were the lack of rotation of the head and the size of the head. A smaller head would make the Coltolux LED more accessible in the posterior areas of the mouth. Half of the consultants indicated that they would switch to this light, while 90% noted that they would recommend it to a colleague. Always replace handpiece in charger so it does not roll off of the countertop. Order additional light lenses and replace when the surface becomes marred. Since this evaluation of the Coltolux LED, Coltène/Whaledent has incorporated some software changes to the unit. The light now has a 20-second cycle time with an audible beep at ten seconds; the unit may be turned off anytime during the 20-second cycle, or will turn itself off at 20. The new 20-second unit is identified by a single black on/off button.